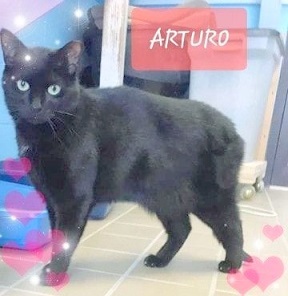 ARTURO is in a Last Hope Free Roamer Room so he is easily overlooked as a pet prospect. He & his twin sister KELLY were trapped in Bay Shore when they were 6 months old…which explains why they were a bit shy as older kittens getting TLC for the first time. ARTURO has been waiting for 14 months for his “happily ever after” home. It will remain a mystery how “fraternal twin” kittens could be different nationalities- ARTURO is an Italian black cat whereas his sister KELLY is an Irish kitty. Come to Last Hope in Wantagh and purrhaps, just purrhaps, ARTURO will free roam into your heart & home. This entry was posted in Adult, Cats, Male, Wantagh Adoption Center. Bookmark the permalink.